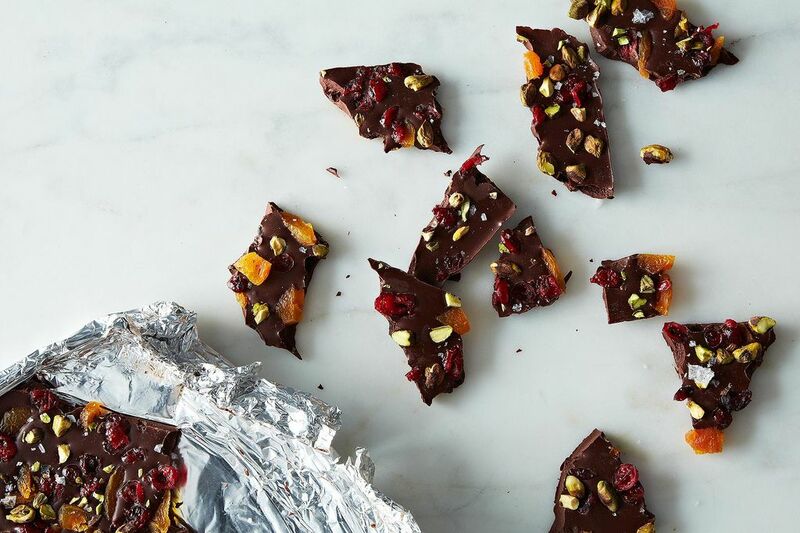 Today: Chocolate bark is the easiest (and prettiest) gift you can make, and there are no rules -- and no recipe required. Ben Mims shows us how. 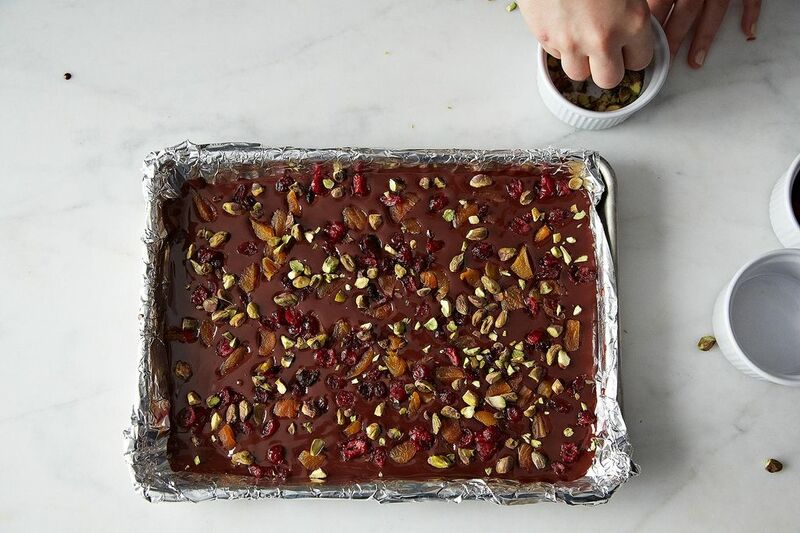 When it comes to candy making, there’s nothing simpler or more satisfying than chocolate bark. There’s no fiddling with wayward candy thermometers, stirring until your arm cramps, or boiling sugar napalm to steer clear of for fear of burning your flesh; just melted chocolate and whatever crunchy goodies you fancy. It looks beautiful in a scattered, organic Pollack kinda way, which explains why it’s synonymous with gift giving during the holidays. The most popular during Christmastime is crushed peppermint candies over white chocolate, sporting the vivid red and white we expect, and producing that velvety after-dinner mint texture and taste we need after large festive meals. Dark chocolate with dried fruits or nuts is a classic as well, but why stop there? Virtually any ready-made snack product can work in a bark: roasted pumpkin seeds, dried coconut flakes, chile-lime Corn Nuts, coffee beans, dried mango, wasabi peas, BBQ potato chips; if you can think of a flavor, odds are, it’ll taste great in chocolate. And even the simplest touches -- a pinch of smoked sea salt, a dusting of crushed cardamom seeds -- can be just as dramatic. Traditional chocolate candy making requires knowledge of tempering to make sure the finished chocolate product sets well and looks shiny and beautiful. 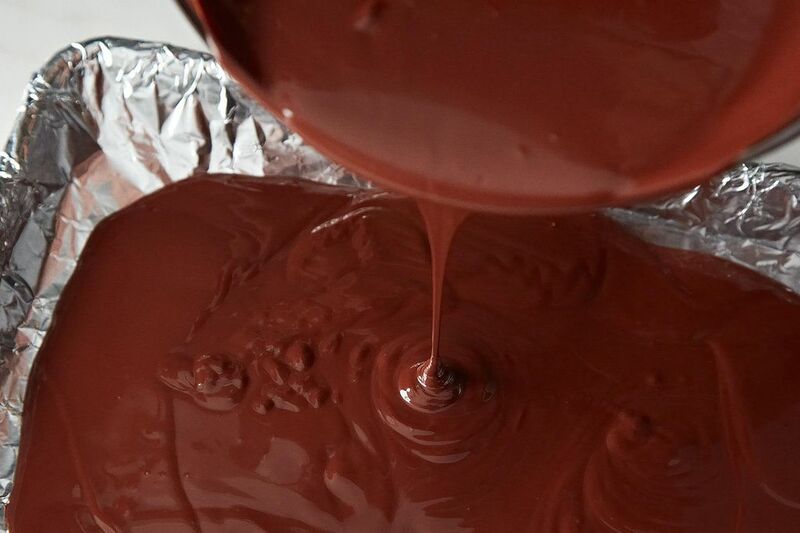 Basically, it involves heating and cooling melted chocolate to certain stages, thus aligning the fats in a way where they coalesce into a uniform final product; it’s a laborious process and can dissuade many from the candy making process altogether. 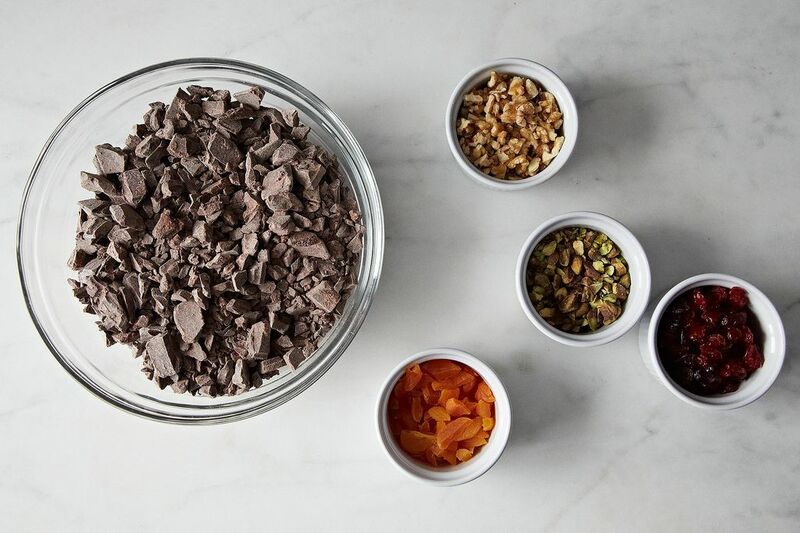 More: If you want to get fancy and temper your chocolate, here's how. My method -- melting most of the chocolate and then cooling it down with some chopped chocolate -- is easy and increases your odds of getting a flawless final product, but there’s a chance it could still bloom, the term for when the fats don’t align and produce white streaks or dots on the surface of the chocolate. If you were making chocolate-dipped cherries or truffles, where the chocolate is all that will be seen, then this would be a problem. But with bark, it’s hardly noticeable with all those toppings. And if you’re still nervous about its appearance, just add more toppings until the chocolate is barely visible ... or use white chocolate, since the bloom can’t be seen against its pale surface. 1. 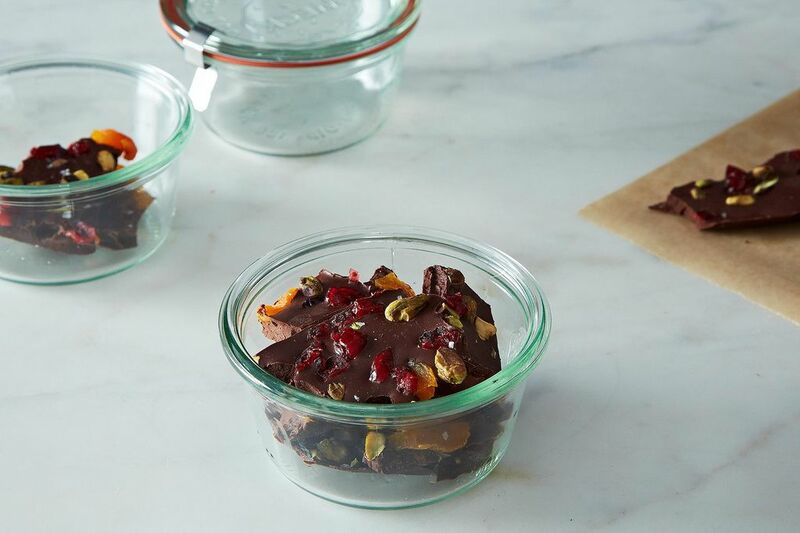 Now, to the fun part: Chop one pound of white, milk, or dark chocolate into fairly fine pieces and transfer three-quarters to a microwave-safe glass bowl. 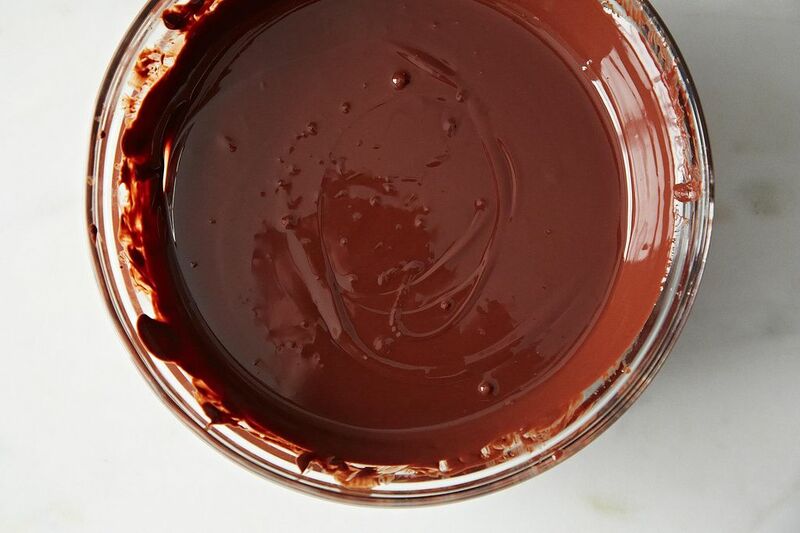 Heat at 50% power for 30 seconds, and then stir with a rubber spatula; repeat heating and stirring in 30-second intervals until chocolate is melted and smooth. Add remaining chocolate, and stir with a rubber spatula until just melted. 2. 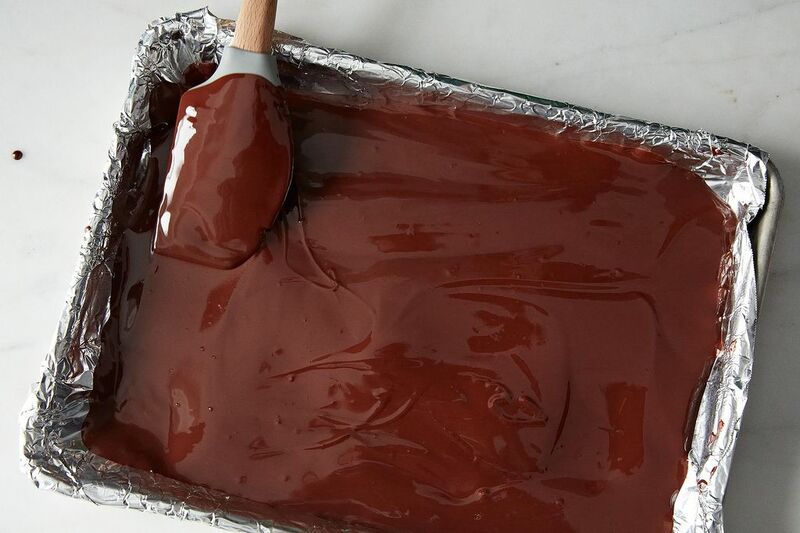 Line a large baking sheet with foil or parchment paper, and pour the chocolate on top. 3. Using the rubber spatula, or better yet an offset spatula, spread the chocolate until about 1/4-inch thick, letting it form whatever shape it takes naturally. 4. Then, start sprinkling: salted peanuts and cashews with dried cranberries or chopped dried apricots is classic, but you can go crazy with whatever you like -- chopped peanut butter cups, toasted pine nuts, candied lavender, or cheddar popcorn. For one pound of chocolate, you’ll need approximately 2 cups total of whatever topping you choose, but if you want more or less, adjust as you wish. 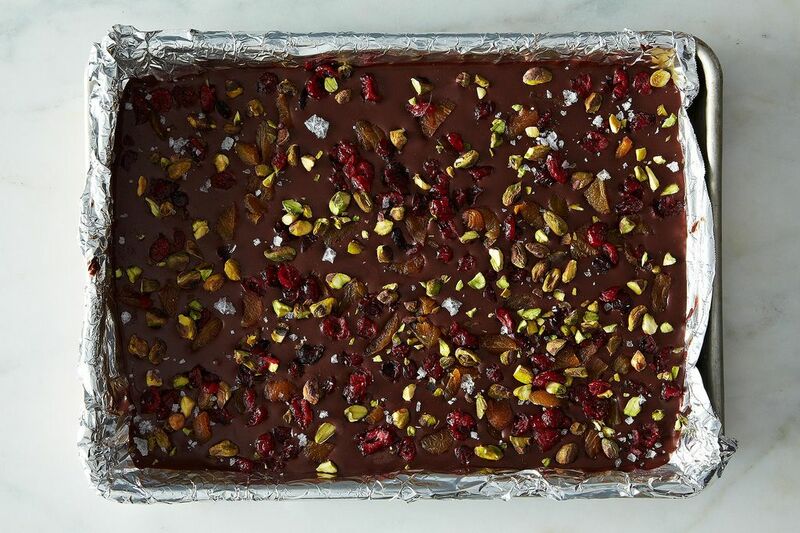 The beauty of chocolate bark is in its limitless versatility. 5. Let the chocolate cool until set, at least 4 hours in a cool part of your kitchen, or 30 minutes in the refrigerator. Break up into bite-size shards and load up into clear plastic bags or pretty jars for storage or to give as gifts. Make sure to write what’s in the chocolate bark on gift tags so the recipient knows what kooky creation they’ll be enjoying during the holidays. Ben Mims is the author of three cookbooks: Air Fry Every Day: 75 Recipes to Fry, Roast, and Bake Using Your Air Fryer (Clarkson Potter, 2018), Coconut (Short Stacks Editions, 2017), and Sweet and Southern: Classic Desserts with a Twist (Rizzoli; 2014). I made this, this past Christmas. It's wonderful! It was also my first time melting chocolate, and I did it without burning. The bark peels of super easy from parchment paper. I used Parchment because I wanted a funky shape to my bark, and it was relatively thin. This Not-Recipe is one of the best I have ever tried. What fun this is! Love the results. Started out badly since I sent my husband to buy the chocolate and he came home with generic Meier chocolate chips. What a glop of ugliness that was. Much better luck with a do over using Scharffen Berger bittersweet. After looking at our cooling bark, we realized that you did not specify the size of your rimmed baking sheet. We used a jelly roll size. Apparently, this is a little large and our bark is a little thinner than we wanted. Any chance of a recipe for that Canadian fave, Maple Walnut? LOVE THIS! my younger son and I discovered bark making last year and it's the one thing I can get him to cook with me now (he's 14, its not cool to cook with mom anymore). We make a swirl of semi-sweet and milk, or white, and top it with crushed vanilla double stuffed oreos. We've also done a semi-sweet with peppermints. We had a horrible time with melting the white chocolate though - any hints? We use only guittard since it is the only one that is made in a nut free facility (the 14 yr old has allergies). Thanks for the great tips! !